In this week's edition: One recommendation, one problematic consideration, and one promising programming note. The Handover ended British rule in Hong Kong more than 20 years ago, yet White Dragon implicitly promulgates the idea that the Chinese still haven't quite got it right, that they still need a White Savior to arrive and set things straight. What do I know, though? I'm an Irish/Mexican-American who's only visited Hong Kong once, for less than a week, and I haven't even kept up very well with recent developments in Hong Kong cinema for the past decade or so. In White Dragon, university lecturer Jonah Mulray learns that his wife Megan has been killed in Hong Kong. (Could his name be a sly reference to Faye Dunaway's characterization of Evelyn Mulwray in Chinatown (1974)?) During their courtship and for the entirety of their three-year marriage, she spent months at a time there, but he always resisted her invitations for him to visit, so he knows nothing of her life there, except that she was a real-estate broker. Soon after his arrival to make funeral arrangements, Jonah, begins to suspect that Megan's death was not accidental. He seeks to find answers to his questions and gets angry a lot. He trusts no one and is suspicious of everyone, manifesting at all times a huge streak of self-righteousness. Portrayed magnificently by John Simm, he is belligerent, pushy, annoying, devious, and antagonizing, the hideous embodiment of Colonial attitudes and behavior. (More than once, he demands: 'Why aren't you reacting like me? ', demonstrating no empathy whatsoever.) Perhaps the heavy strain of grief has caused him to revert to the personality of his younger days. He did not marry until his 40s and in the flashbacks we are shown, which are all related to Megan, he is joyous, loving and quite, quite wonderful. 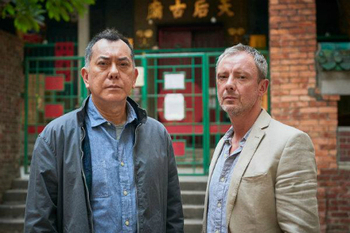 In his unofficial detective work, he comes to close contact with David Chen, played by Anthony Wong, and it's lovely to see Wong in a major role for British television. (Originally titled Strangers, the series was produced by ITV and filmed in 2017.) He easily moves between the kindly and menacing edges of his initially opaque character, a former police officer turned security guard. Katie Leung, perhaps still best known as Harry Potter's love interest really shines in a gritty role as Lau Chen, David's daughter; she is tough and no-nonsense, and develops a close relationship with Becky (Kae Alexander), who she meets at a rally against powerful businessman Xo (the great Kenneth Tsang). The rally and protests provide the only glancing, perhaps unintentional acknowledgement of changing times in Hong Kong, though they ostensibly have nothing to do with Mainland rule, but about Xo's candidacy for Chief Executive. Created by Mark Denton and Jonny Stockwood, and directed in its entirety by Paul Andrew Williams, I found White Dragon to be somewhat infuriating as a missed opportunity for not making better use of its cultural, Hong Kong background. It's principally about Jonah Mulray seeking to understand his wife, with a lot of Chinese people (mostly) getting in the way, to his supreme irritation. Not that the British residents of Hong Kong are praiseworthy, either. They've all got their secrets too, including most notably the two prominent female supporting players in the cast, British Deputy Consul-General Sally Porter (Emilia Fox) and Xo's #2 exec Rachel Hargreaves (Raquel Cassidy). The men are not to be trusted, either, although British journalist Michael Cohen (Anthony Hayes) is portrayed as some kind of rogue hero. Summing Up: The 'white savior' complex rules in White Dragon, and soured what might have been a far more satisfying experience. Great Hong Kong locations, though, and sterling performances by John Simm and Katie Leung (and the presence of Anthony Wong) nudge it into mild recommendation territory. The new service will launch officially on April 8, 2019. To help promote it, a free "movie of the week" program began on Wednesday, January 30, featuring Elaine May's Mikey and Nicky along with several extras. This week, the featured title is Wong Kar-Wai's Chungking Express, which is one of my favorite movies of all time. Watching Chungking Express at home about 20 years ago, on top of John Woo's The Killer and Hard Boiled, ignited my fervent interest in Hong Kong cinema, which did not truly abate until my personal funds began to run low some years later. Watching it again this week, albeit on a laptop hooked up to my TV, brought back a flood of pleasant memories. I can also confirm that it remains a personal favorite, one of the very few movies that leave me in tears as the end credits roll, even after repeated viewings. I can't quite explain that, nor do I particularly want to understand my emotional reaction, but when Faye Wong rolls up, I am already lost. For this and many other reasons, I am glad that I have already subscribed to The Criterion Channel. 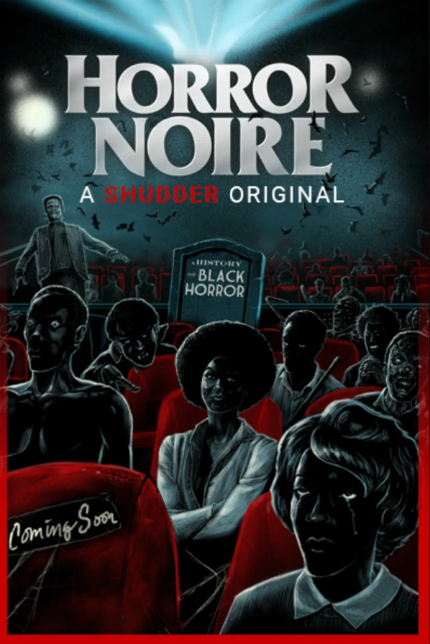 Summing Up: Recommended, based on Criterion's past record, though you may want to wait until the service launches and try a free trial before deciding if it's worth it for you and your viewing habits. The help page suggests it will be available via Amazon's Fire TV service. So far, no word on whether it will be available outside the U.S.